Hiking in the Greater Toronto Area! Each Sunday (mostly) during the spring and fall, we meet to car pool to parks and trails and go hiking. If you want a low impact work-out, fresh air and new people to meet, check us out. We carpool from Old York Mills Road, usually at 10:00am. Always, always, always check our hike instructions. 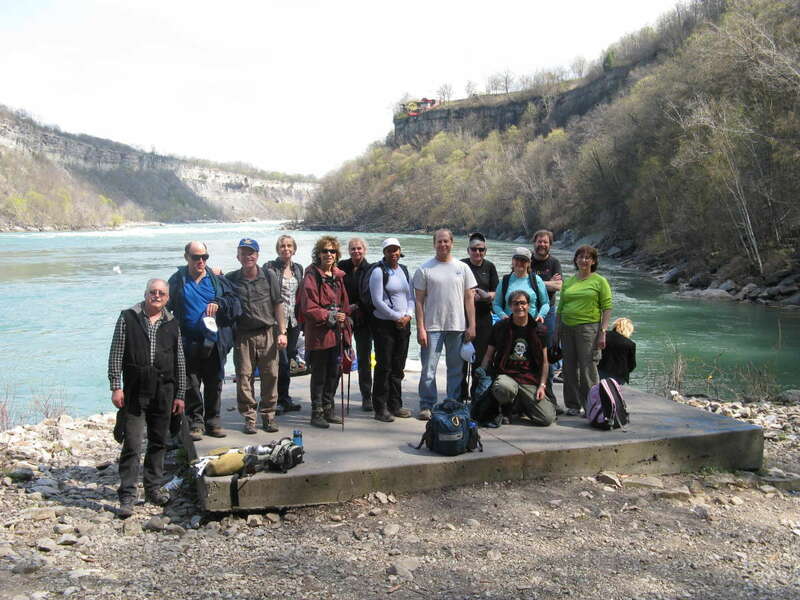 This Sunday, we are hiking Long Sault out east of Toronto, with hike leader Howard Gibson. We are doing our standard 10:00am pickup at Old York Mills Road. We have a hike destination for Sunday, Grindstone Creek with new hike leader Carol Pyke. The trail head parking lot is tiny, so if you can, please pick up at Old York Mills Road. This Sunday, Abi Yousufi is leading us at Seaton Trail. We pick up at Old York Mills Road at our standard time of 10:00am. Next Sunday's hike is to Lowville with hike leader Deborah McDermott. We pick up at Old York Mills Road at our standard time of 10:00am. On Sunder, we are hiking the Humber Valley Heritage Trail in Bolton with Bohdan Bilyj. We pick up at Old York Mills Road at our standard time of 10:00am. We are hiking at Singhampton Caves with Andy Hueton. This is a Level 3 hike, with lots of rock scrambling in the caves. It is cold, and there is snow on the ground up there. It is time for your winter tires. Be ready to dress for winter. We pick up early at 9:00am at Old York Mills Road. We have a hike destination for next Sunday, Rouge Valley with hike leader Jacquie Johnson. Jacquie is planning to do twenty kilometres, so you need to be fairly fit for this one. We pick up at 10:00am at Old York Mills Road. This weather this coming weekend is way more promising than it was last weekend. We are doing Hockley Valley with Robert Freeman. We are back to hiking on Sunday, and to our standard Old York Mills Road pick up time of 10:00am. Our Niagara Gorge (USA) hike is cancelled, due to the predicted thunderstorms tomorrow. We are watching the weather for tomorrow, Saturday. Thunderstorms are a possibility, and we may have to cancel Niagara Gorge (USA). Please check this space, and our Meetup for our final decision. We will decide at 5:00pm. Our hike for Thanksgiving weekend will be on Saturday. Hike leader Bill Baird is taking us to Niagara Gorge (USA). On Saturday morning, we depart Old York Mills Road, early at 9:00am. We are crossing the border, so you need your passport. You will not get across the border without it. Out hike this Sunday is Primrose Boyne River with veteran hike leader Andy Hueton. There is very limited parking at the trail head. Carpooling at 10:00am at Yonge and York Mills is strongly recommended. Hiking season, and hopefully, cooler weather is upon us. We are trying to fill the schedule. We have the first two weeks worked out. This Sunday, we will start at Long Sault with hike leader Howard Gibson. Old News -- this runs on quite a bit.